The Internet can be a confusing place when you’re looking for current, high-quality information. 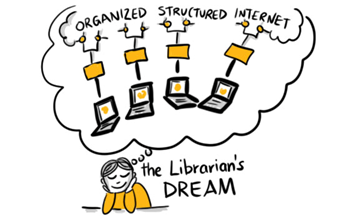 Despite recent efforts by some to impose an order to the Web, for the most part it remains without a relatable structure or any real rules for classification, which librarians have been concerned about since the earliest days of the Internet. Most searches begin with a straightforward keyword search. It pays to take a few moments to consider the best keywords to use. For example, suppose you are searching for information on a game you can use to teach a concept in a chemistry class. If you plug in chemistry game, you would expect the search engine to return anything with chemistry or game in the searchable information. But what if game isn’t the best word to use? Perhaps what you are really after is a simulation? Would your search find for you what you want? Think of different words that other people may use to describe something. You may reveal hidden gems, especially when searching a resource that lacks a defined organizational structure (i.e., the Web)! For example, even for something as common as a writing utensil, consider all the ways different people may choose to describe the object and how that might impact either finding what they describe or understanding what the object is. Once you have entered your words if you want to see the voting results and compare your answers to your colleagues, check out the ever-changing word cloud . Here is a quick review of how to use limiters or Boolean Operators. Learning how to use limiters—or Boolean operators—can save you a lot of search time. Boolean operators are the words “AND,” “OR,” and “NOT.” They are small words with a lot of search power! For example, suppose you are attempting a basic search to find information on learner motivation at postsecondary institutions. You identify “colleges” and “universities” as your basic search terms. If you search “colleges AND universities,” your results must include both terms. The starred (overlapping) area in the graphic below depicts the results. If you search “colleges OR universities,” your results change, with the stars now in both overlapping and separate areas. And if you choose to narrow your search to “colleges NOT universities,” the results are different again. Using “AND” narrows your results as both terms must be present; there is more precision in your search. Using “OR” expands your results as only one term must be present; you have less precision, but you are also less likely to miss an important resource. Using “NOT” excludes a term completely; you will want to use this with care as you might miss an important resource. The three-minute video about “Boolean Operators – Science” (B. D. Owen Library, July 2015) provides examples of conducting searches. If, like the majority of the world, you use Google as your primary search engine and want to dig deeper in building your search skills, consider the self-paced courses offered through “Power Searching with Google”. Take this short quiz to review how Boolean operators work. Now you are ready to explore the various curation tools and repositories using your refreshed search skills. Remember, pay close attention to your search terms. Do not assume a repository has nothing about your subject if the results are low or zero. Try searching again using another term or word to describe your subject area. And remember to use your Boolean operators!